Lions, along with dragons, are the animals most commonly depicted in Chinese art. They range in size from monumental sculptures to the tiniest of amulets. Lions are valued for their protective symbolism. 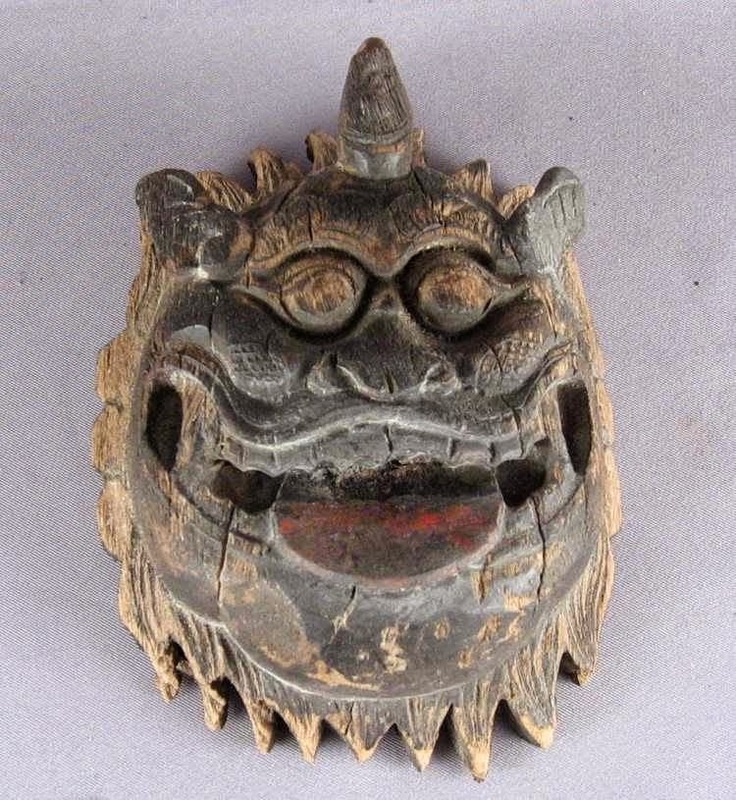 In architecture, lion guardian statues are placed flanking doors, and inside of houses are found the subject of today's post, small wooden masks carved with the features of lions. These masks invoke the fierce qualities of lions to repel evil spirits, and when found among Chinese antiques often possess a charming, folk-art quality. The ones shown here measure from less than two inches to about five inches across. The features on these lion masks are very stylized rather than realistic, and mythical elements may be incorporated. 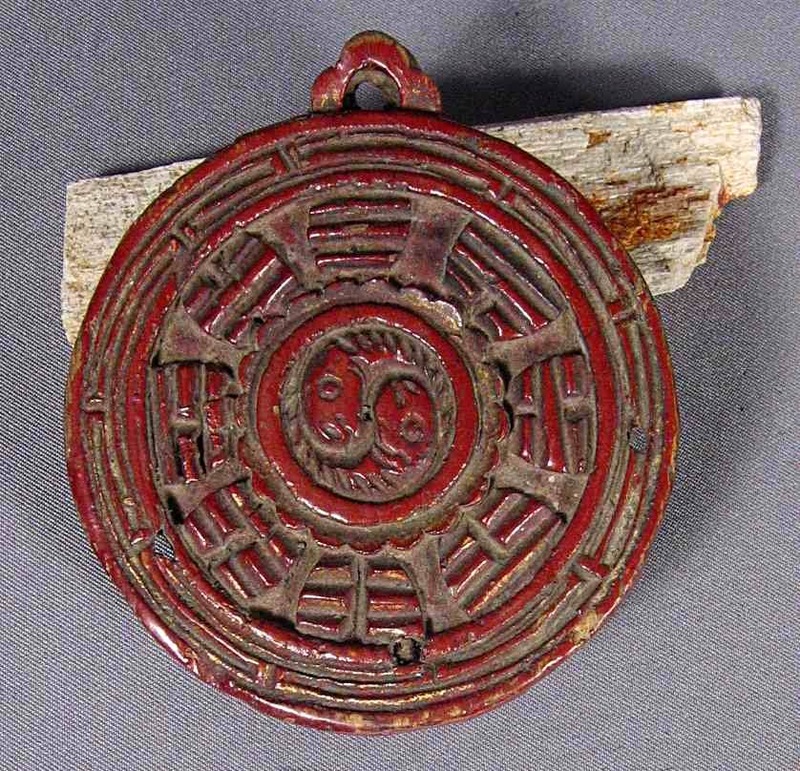 Painted red and with traces of the original gilding, this round example is very typical. The lion has large bulging eyes, with a prominent nose and forehead. The mouth is open, exposing the teeth, fangs, and protruding tongue (some varieties also carry a sword in their mouths). Tufts of fur are indicated in various places, and around the perimeter. Veering from the Western concept of lions is the single horn in the middle of the forehead. Also on the forehead is the Chinese character wang, ( 王 ) meaning King. In this example the word King is carved on the horn itself. Finally, there are three small holes, from which small bells were originally hung further to help scare away unwanted spirits. Here is the back of the above example. A rounded fretwork border surrounds a ba-gua design. These eight-sided figures containing eight trigrams are important in Chinese religion. The configuration of the trigrams conveys meaning, perhaps in this case personalized for the original owner. 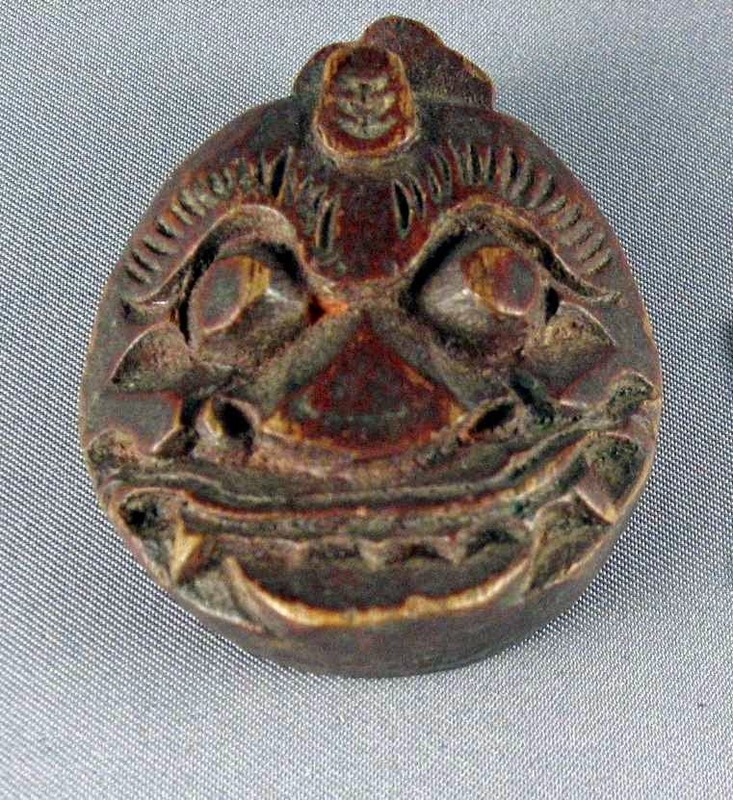 In the center of the ba-gua is a yin-yang symbol, here charmingly carved as two complementary fish. Some masks are carved in a style allowing for more freedom depicting the features. In this rather squared-off example, the ears and especially the horn are allowed to protrude. The eyebrows are almost shaped like bats, and the King symbol has been replaced by four dots. 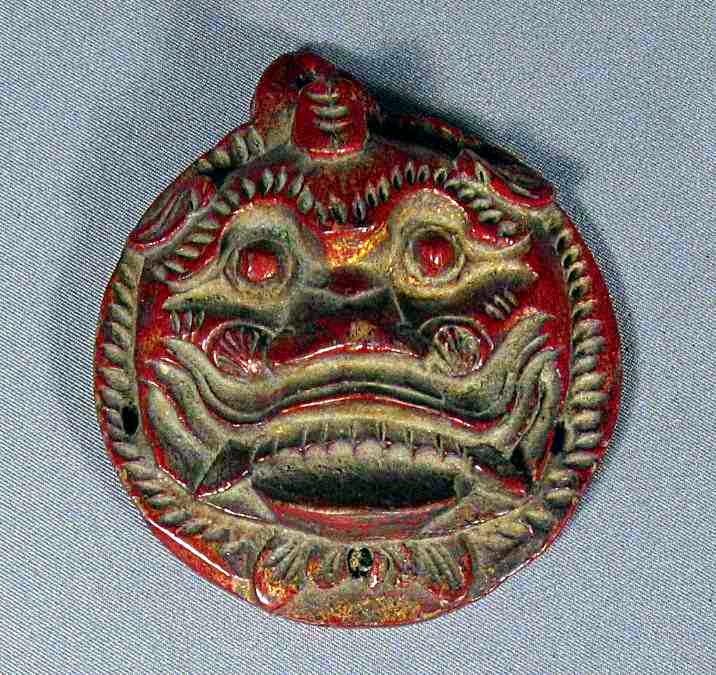 The above rather elaborate lion mask has well preserved paint of black, red, gold and white. Tufts of fur typically appear as odd geometric shapes and patterns, highlighted in red. Even the arms of the King symbol seem to flow as though they were part of the fur. The eyebrows have assumed a flame-like shape. The bright red tongue is plainly visible, and the white teeth have a startling and strangely human quality. If I were giving these masks names, this one would have to be called Dopey. His double chin, broad grin, and beady, narrow-set eyes all conspire to give him an unintelligent yet genial look. Still, this piece is carefully carved: the horn is so accurate that it looks like the real material, and shaggy tufts of fur form his asymmetrical beard. The back view of those irregular tufts is a favorite detail of mine. 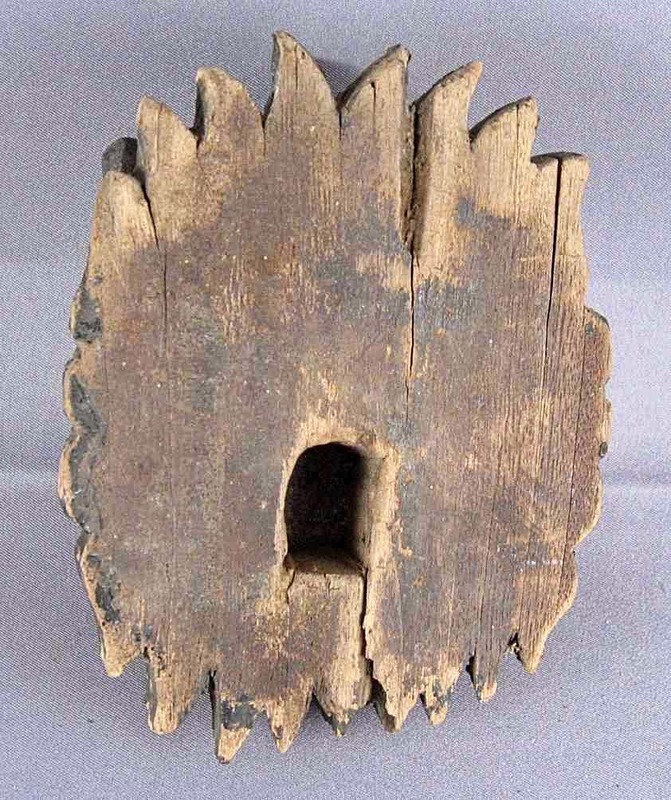 The reverse side shows a mortise instead of a simple hanging device, suggesting that this once may have been part of a larger object. If so, the imagination boggles at what the entire original creation must have looked like. This one makes me want to brush my teeth. I am not sure why some of these have such flat sides, as though reflecting the shape of the board they were carved from. This red and black example has a bushy fringe of beard, and the King symbol has the three cross bars carved, but not the vertical stroke, giving this lion the appearance of having worry lines. 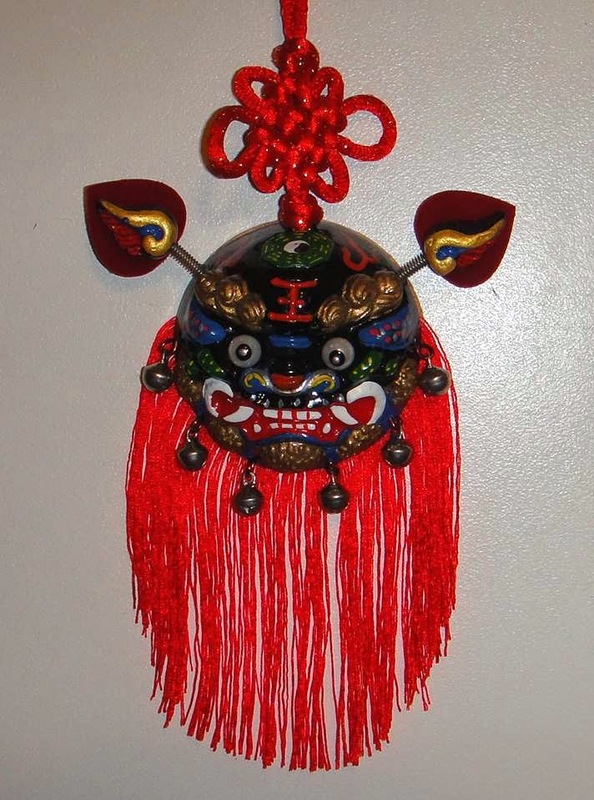 Lion masks are still very much a part of Chinese culture. The above mask, a recent gift from local friends, adheres faithfully to the ancient model—the round shape, fierce, exaggerated features, bared teeth, small bells and King symbol are all present. The horn, however, has disappeared and been replaced by a miniature ba-gua. 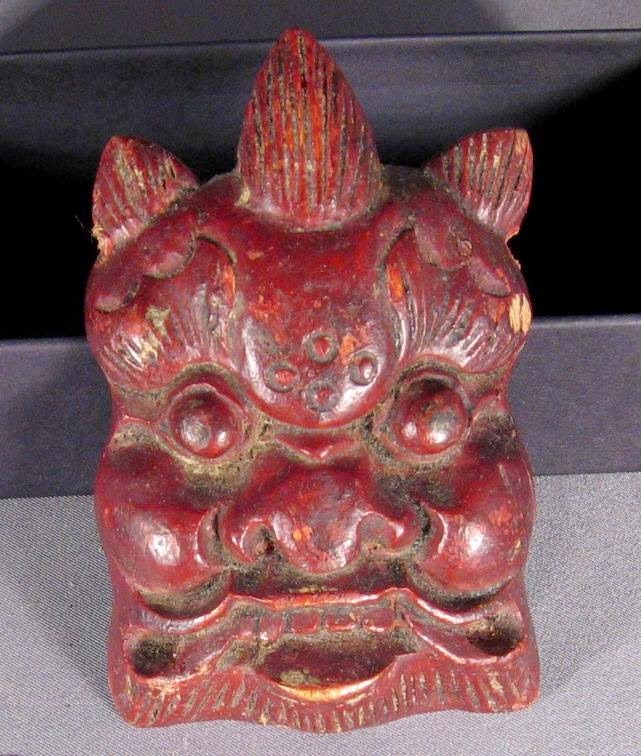 Similar lion masks can be spotted frequently exerting their good luck spell on door-knockers and in colorful tile work. 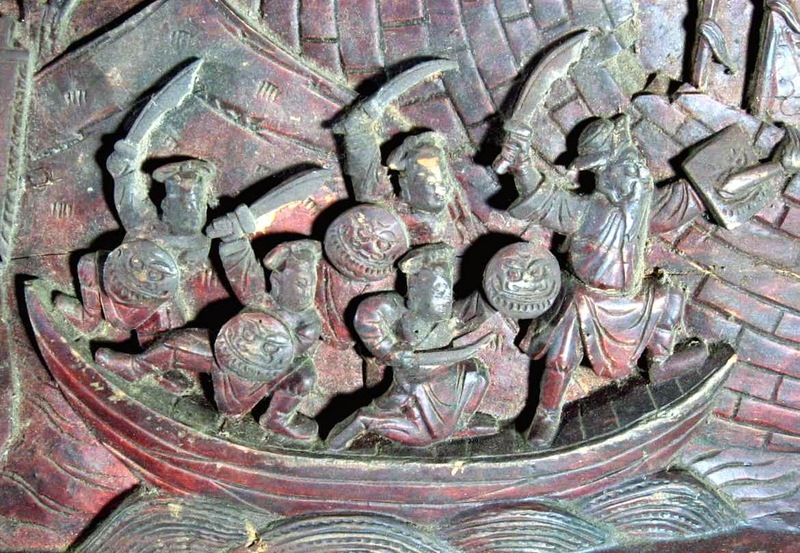 Shields often assumed this form, as in this battle scene of warriors in a boat storming a walled city. I find this carving amusing because the lion shields look ready to be cut out and hung as individual amulets. Other countries also display talismans in the home to bring protection and luck. Horseshoes and Pennsylvania Dutch hex signs come to mind, as do the intriguing witch balls recently featured by ChronicaDomus. 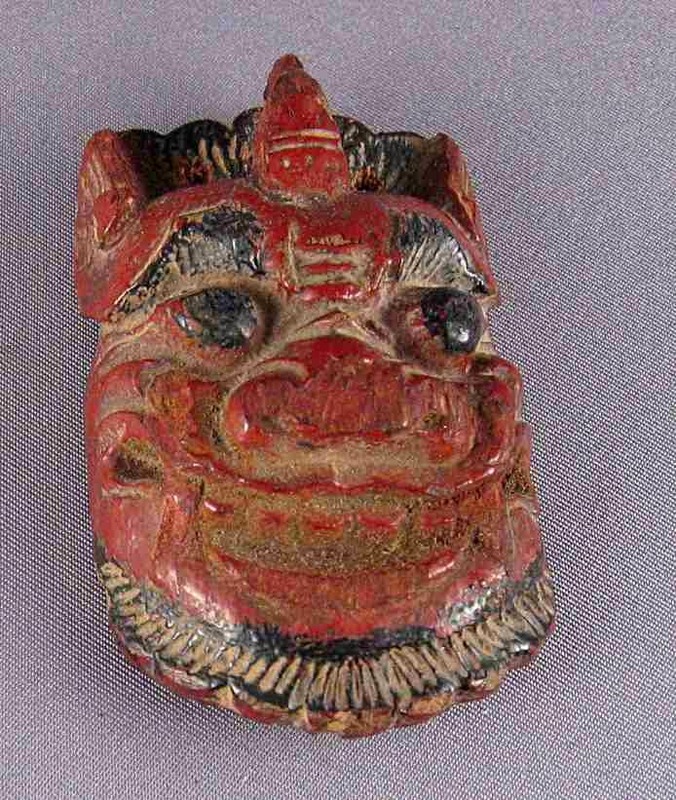 Among the wide array of Chinese amulets, lion masks were popular choices. Let me know which one of the masks presented here you would rely on to keep evil spirits at bay, or whether you have other good luck pieces protecting your home. Another round example, this one very tiny, only about 1.5 inches across. All photographs and original objects property of the author. What a wonderful and interesting collection you've assembled, Jim! Some of those look like Foo dogs, which are considered lion dogs. Thanks for sharing the size, because they all appear much larger thanks to their intricate carvings and rich details. I will have to see if Mom and Dad have any lion masks adorning their pieces. Enjoyed this post! Hello Loi, I was planning to discuss this confusing nomenclature in a post about 3-D lions, but you are right that the term 'foo dog' is basically synonymous, although these are definitely intended to be lions. I am sure that such lions are abundant on your parents' antiques.Because some Chinese pieces are so ornate, individual details can become submerged in the larger design. I was about to write on this very subject - the nomenclature. Foo dogs would be a very odd breed indeed. I shall await your words of wisdom as to why the name exists. I have Chinese lions on my soap stone seals. The lion with its tongue hanging out, above that of "Dopey", is my favourite, of those you show. As always, a fascinating post. Hello Columnist, The term "foo dog" is a mystery indeed. The word foo could be interpreted to mean lucky, but here, they are always simply called lions, with no adjective. Interestingly, the new one illustrated here is labeled on the back in Chinese as "Lucky Lion" but the word for lucky is ji-xiang, not fu. My vote is for going back to just calling them lions. I am reminded of the very cute and fluffy dog breed, the Chow Chow, whenever I see a lion depicted in Chinese art. Perhaps the "food dog" was based on Chow Chows as they were once used to guard the entrance to royal palaces. Hi CD, I don't think that there is any definitive answer to the foo-dog mystery. Possibly there were several sources that reinforced each other. I will have to keep my eye out for early references in English, and see if those yield any clue. In Chinese, it is very simple: they are simply lions. I think the "elaborate" one would do a fine job of keeping away evil spirits. Something about those eyes, and the tongue. Is Dopey's tongue sticking out too? He has a certain charm, but I fear he might fall asleep on the job. Your teeth brushing comment made me smile, and that mask has a lot of character. The last one is so detailed for something so tiny! It reminds me a bit of a jack o' lantern. These are fabulous, Jim. Thanks so much for sharing them. Hello Jen, Most of these do have the protruding tongue, I guess to make them look more fierce. Sometimes the angle of the photograph makes the tongues more or less apparent, but it is also a sign of quality--the more the tongue sticks out, the harder it is to carve, and the larger the original block of wood required. You comment about the jack o' lanterns is brilliant--that is exactly what these resemble, and the original purposes were closely related! The critical sentence seems to be that "the features on these lion masks are very stylized rather than realistic, and mythical elements may be incorporated". Most people are lucky if they recognise and understand their own nation's symbols and mythical elements, let alone those from another nation. So blog posts like this one are therefore important, thank you!. Hello Hels, You bring up an important point, that it is difficult to look at one of these for the first time and realize what they represent. That is why I described the individual features at such length; understanding these makes the entire figures easier to compass, and allows the viewer to fit them into the larger world of Chinese art. Hello Jim - the only object I have which could be considered a protector is the Evil Eye I carried home from Turkey. We do have a couple of dragons which H brought back from Indonesia - Isn't it strange how many different countries have dragons present in their culture? Here as you know we have St. George and the Dragon and Wales has a dragon on her national flag. Many of your fine collection of lion masks remind me of the stone gargoyles carved on churches. I now realise thanks to your post why so many houses have brass knockers in the shape of a lion, I hadn't associated it with good luck before. Hello Rosemary, It is interesting to compare the dragons from different countries, in fact all the mythological animals. I don't think anyone really knows which ones came first, or whether similar beasts were invented independently. Gargoyles are another excellent parallel to the use of fierce animals to adorn buildings. 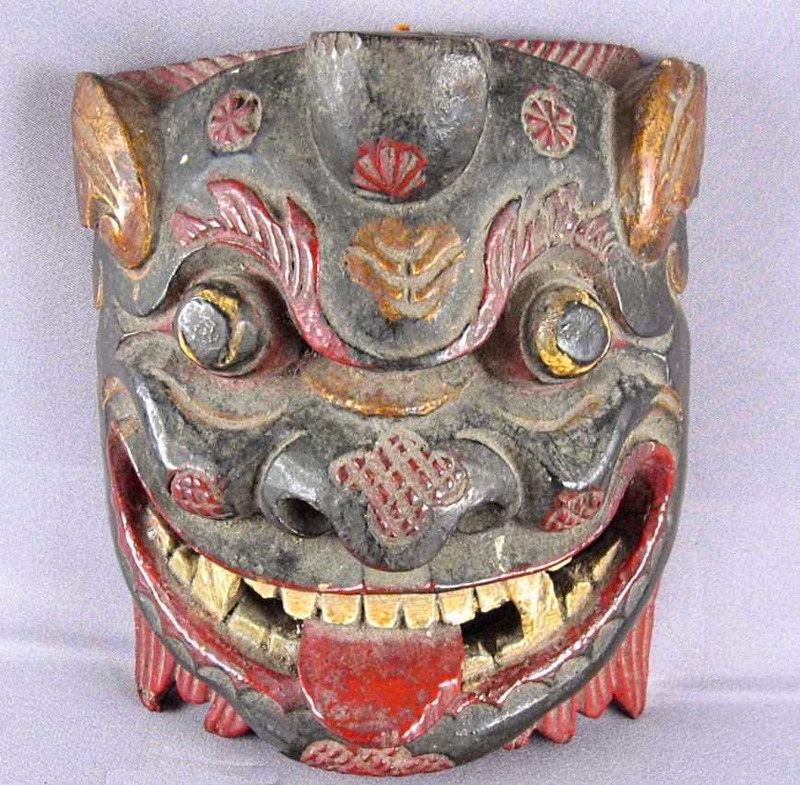 Like these lion masks, they have exaggerated features to make them even more terrifying, yet still are considered emblems of good luck. Hello Barbara, I think I know the kind of glass lion you are talking about, beautifully carved and colored. That kind of art glass is wonderful, and those companies also make architectural glass pieces that I always covet, either in the showroom or already installed somewhere. I never thought of it before, but there are a lot of people named Leo here, and I'll bet you're right that the popularity of the name stems from the admiration of these mythical lions. I can understand why you treasure your four-leaf clover. Sometimes I find them pressed in the pages of an old book, and wonder about their special meaning to the person who saved them so carefully. Your lion mask collection is fascinating. Each one so very different and yet all showing similar characteristics which, thanks to your erudite commentary, we now have a better understanding of. Our favourite is, possibly, the first and we rather like the idea of hanging bells to give further warning to evil spirits that they are not welcome. It looks to be so beautifully detailed in its carving and the deep red colour is so appealing. The traces of gilding add to its beauty....shades, perhaps of a more glorious past. And now we have a wonderful idea for the front door of our new house. It lacks good door furniture and a substantial lion's head knocker seems to fit the bill perfectly! Then, we can herald the arrival of friends with joy and ward off unwelcome visitors at the same time! Hello Jane and Lance, You are right that a large part of the attraction of collection is discovering the endless variations, especially if some meaning or intent can be discovered behind them. I agree that the first one has some of the finest carving, which makes the piece rather jewel-like, given its small size of about two inches. The weathered gilding adds to its charm--it might have looked rather gaudy when new. I think that a lion door knocker for your new door would be excellent. You have the choice of one of the Chinese knockers, which would be exotic and eclectic, or a Western lion, traditional and British, to welcome guests. Either way, dignified bronze would inform guests that they were about to enter an extraordinary home. This is the first time that I have found your blog. I sometimes work at the Horniman Museum in SE London and we have some masks similar to this that the public can touch. You've taught me new things. Thanks. Hello Katharine, Thank you for your comment; I am glad you found this post interesting. You are lucky to work at the Horniman, which has long been on my list of places to visit in London. I greatly admire the Horniman's collection of musical instruments, especially its wind and brass instruments, for which it is famous. Fascinating post about all those different lucky lions! There for sure is a lot of Chinese culture in Java, Indonesia as well since you find numerous lucky lions. The mythical part of it for carving them with features that scare or demand respect, certainly adds to their beauty. Never had seen a witch ball before, interesting and beautiful at once with the chain attached. We will watch your video this week; finally catching up on things now Mom's solemn requiem mass has been on the 31st. We got it videotaped by our Goddaughter's husband (no kins...). Hello Mariette, Yes, cultures do have a way of spreading their influence over a wide area, as you have often shown in your own posts about the many positive influences the Dutch have had in America and other places. I agree with you about the fascination of Chronica Domus' witch ball, with its mysterious appearance and history. I can imagine that you have been having a difficult time lately, but you can be comforted by knowing how many people have come to admire your mother and her character through your writings. I hope that the mushroom video works this time for you. You have a wonderful collection, and when I see your Chinese antiques I think to myself that it must be very gratifying to your Chinese friends to see your interest in their culture. Perhaps they even see their own heritage with a new eye. My favorite of the grouping is the second lion (third photograph). I like the carving and, for a lack of better words, its patina. I have a Vietnamese tile mask of a dragon, about the size of your masks, and it has a really rich green glaze, which I associate with Vietnam. Regarding Rosemary's comment, I've always wondered whether St. Geroge's dragon is not mythical, and that he might have in fact encountered a komodo dragon . . .
Hello Mark, I like your observation about the way the people respond to an interest in their culture. Probably my friends go to more museums and old houses to please me, but we all end up having a good time. Showing people around Cleveland definitely increased my own pride and interest in its attractions. That monochrome red mask is in a style that you sometimes see here, with no accent coloring. Its boldness makes it hard to judge the scale, but it is actually quite small, about 2.5 inches wide, and 4 inches tall. I am wondering whether your tile mask is an architectural component, rather than a stand-alone sculpture. Your description reminds me of the tiles that edge the eaves of temples. It is interesting to look at dragons and other mythical or semi-mythical animals from an anatomical point of view, in order to determine what could have inspired them. Take away the cloud-like shapes, etc. and what is left does look closely related to actual lizards. How nice to find another intriguing post has been published on a subject I know very little about. However, as you asked I would love Dopey to help protect my home from whatever naughty spirits lurk about the place. He looks to be a very friendly sort and not at all intimidating. I also liked the last mask you feature. That too looks to have a very friendly demeanor about its face. In some cultures, the Turks for example, a blue glass eye is hung in the home to guard against what they call "the evil eye". Some even wear one around their necks on a chain. Thanks too for the kind mention. Hello CD, These little masks are so stylized that none look really scary; I think the friendly-scary look they have just about suits them. The tiny one that you like also has a ba-gua carved on the back of it. I wish I could have photographed these all together to indicate the scale. I have seen those Turkish eyes, and like symbolic eyes in general. I once bought my sister a bronze amulet with a row of eyes on each side--very strange, and I have never seen anything like it. Those masks are beautiful. Dopey is quite cute actually but to be honest there was something mildly terrifying about lion depictions in the East for me, especially as a child. I remember quite vividly having nightmares after seeing a lion dance as a small child. That's quite interesting about the horn - I have always wondered what caused that detail since lions don't really seem to have horns in the wild. :) I thought perhaps it was inspired by a bad hair day instead. Hello Ann, It's funny how some people enjoy "scary" things, while others avoid them. I don't think that these lion masks are meant to terrify people, although they do have a certain edge to them which for me adds to the fun. I can imagine seeing a dancing lion would be a rather traumatic experience, even for an adult! It seems the lions from the south of China are more often depicted as having horns. Also, some of the mythical lion-like animals that can have horns are the pixiu, which is lucky, and the nian, associated with Chinese New Year's rituals, so either of these might likely have had an influence on lions in art.